Wedding dress shopping is one of the most exciting parts of planning your wedding. It can also be one of the most trying parts as well. From deciding what style of dress you want and then shopping around for the dress of your dreams, it can seem like a daunting task. Not to mention fittings and finding the right accessories. We have created helpful wedding dress infographics to help put you at ease before you commence on your wedding shopping endeavors. Sticking to a proper timeline is critical when it comes to wedding dress shopping. You need to make sure that you have enough time allotted for shipping if needed. As well, you need to allow for ample time for fittings before your wedding. This infographic will give you a timeline for not only shopping for your wedding gown but other helpful wedding planning guidelines as well. The actual process of bridal gown shopping is exciting yet overwhelming. You want to make sure that you do all of your research and are organized as well. Our wedding dress infographics will give you some tips on things to consider before you begin your wedding dress shopping adventure! This way you can enjoy every moment and not have to worry! Also, you can read how to prepare for wedding dress shopping. Not every bride has unlimited funds when it comes to her bridal gown budget. You must set a strict budget and stick to it. Remember to factor in such details as for shipping charges (if any), fittings and alterations and any accessories. You don’t want to spend your entire budget on the bridal dress itself only to realize that you do not have enough funds to cover shoes, accessories and such. This infographic will help you determine a realistic wedding gown budget. Consider Secrets to Help You Save On Wedding Dress Costs (and more). Every bride hopes that she will find the dress of her dreams straight away. However, realistically, you will probably have to try on quite a few gowns before you narrow it down. You need to decide on your details including silhouette, train and so forth. Our guide will explain the different types of dress silhouettes to help you decide which one will best flatter your figure and match your style. Once you have decided on a silhouette and so forth, you will need to consider other details such as the back of your dress, sleeves, and waistline. Our wedding dress infographics depicted will give you some guidance on how to choose the other important details of your bridal gown. Necklines are another detail you need to think about when wedding dress shopping. From V-neck to halter to sweetheart, there are so many styles of necklines available. You want to find the one that will best flatter your figure. Also, you will want it to stay true to your personal style as well as the theme of your wedding. Comfort is a key factor too when choosing a neckline style for your wedding gown. Look on Gorgeous Sweetheart Neckline! Length and style of wedding dress train is also a key factor in choosing your gown. Do you want a longer train such as a monarch or something simple like a sweep? Also, you need to think if you want a removable train or one that needs to be bustled after the ceremony. Our wedding dress infographic will give you information on the different types of wedding dress trains. It is also important to choose the right fabric and color for your bridal gown. Do you want a traditional white dress or something more modern? Do you prefer silk or satin? Both the color and the fabric also depend on the time of year, the venue and the theme of your wedding. This infographic will give you some insight as to the different types of wedding gown fabrics and colors. Be sure that you are in trend. Wedding veils are so pretty and delicate, but there are so many styles available. How do you know which one to choose for your wedding? This chart will help give you some insights as to the different styles and lengths of wedding veils. As well, there are some tips on material and lengths to help you choose. Choosing the right lingerie for your wedding gown is a big deal. You want your lingerie to flatter your figure, especially your bust line. As well, it has to match the style and color of your gown. You can’t have your bra straps showing on a strapless and/or backless gown! As well, you cannot wear black lingerie under a sheer white gown. Use these wedding dress infographics to help you determine the proper lingerie for your wedding dress. While wedding veils are beautiful, not every bride may opt for a veil. What if you wanted a tiara or perhaps an old-fashioned hat? As well, you could adorn your hair with flowers or jeweled hair clips. Infographic will give you some advice on the various types of wedding hair pieces and how to choose. As a rule, you don’t want to choose your other wedding accessories such as gloves, jewelry, shoes, etc until after you have chosen your gown. If you have a family heirloom piece such as an antique ring or whatnot, you should choose a gown to compliment that particular piece. Otherwise, you want your accessories to compliment your gown, not take away from it. Pin a guide on how to properly accessorize your wedding gown. 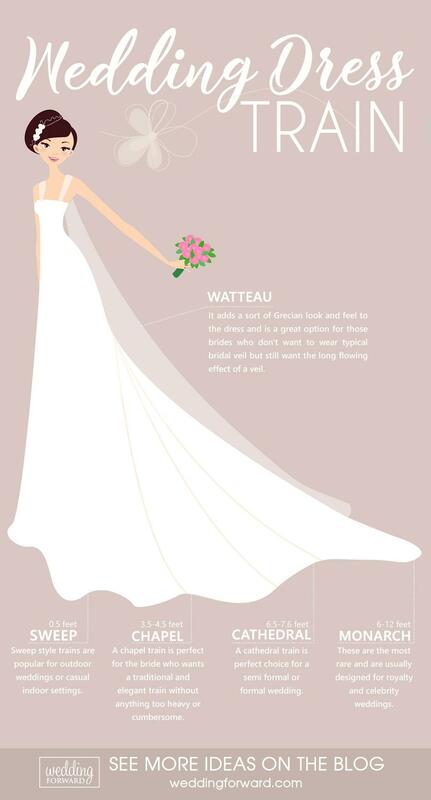 We hope that you have found these wedding dress infographics to be helpful! Now get out there and find the wedding gown of your dreams!